AUD 2,148 Excl. Duties / Taxes. This Radiant diamond is 0.65 carat in weight, and comes with Excellent polish and Very Good symmetry, as verified from an independent gemological laboratory. The diamond is graded F in colour, and has a clarity grade of VVS2. The diamond's GIA grading report number is 2201116282, which will detail further its specifications and measurements, and will also come with the purchase of the stone. AUD 20,707 Excl. Duties / Taxes. This Radiant diamond is 2.02 carat in weight, and comes with Good polish and Good symmetry, as verified from an independent gemological laboratory. The diamond is graded H in colour, and has a clarity grade of VVS2. The diamond's GIA grading report number is 2205167584, which will detail further its specifications and measurements, and will also come with the purchase of the stone. AUD 15,842 Excl. Duties / Taxes. This Radiant diamond is 1.75 carat in weight, and comes with Excellent polish and Excellent symmetry, as verified from an independent gemological laboratory. The diamond is graded H in colour, and has a clarity grade of VVS2. The diamond's GIA grading report number is 2193947137, which will detail further its specifications and measurements, and will also come with the purchase of the stone. AUD 8,691 Excl. Duties / Taxes. This Radiant diamond is 1.21 carat in weight, and comes with Very Good polish and Very Good symmetry, as verified from an independent gemological laboratory. The diamond is graded H in colour, and has a clarity grade of VVS2. The diamond's GIA grading report number is 2131550445, which will detail further its specifications and measurements, and will also come with the purchase of the stone. AUD 7,205 Excl. Duties / Taxes. This Radiant diamond is 1.01 carat in weight, and comes with Very Good polish and Very Good symmetry, as verified from an independent gemological laboratory. The diamond is graded E in colour, and has a clarity grade of VVS2. The diamond's GIA grading report number is 1298985397, which will detail further its specifications and measurements, and will also come with the purchase of the stone. AUD 5,898 Excl. Duties / Taxes. This Radiant diamond is 0.91 carat in weight, and comes with Very Good polish and Good symmetry, as verified from an independent gemological laboratory. The diamond is graded D in colour, and has a clarity grade of VVS2. The diamond's GIA grading report number is 16176863, which will detail further its specifications and measurements, and will also come with the purchase of the stone. This Radiant diamond is 1.92 carat in weight, and comes with Very Good polish and Very Good symmetry, as verified from an independent gemological laboratory. 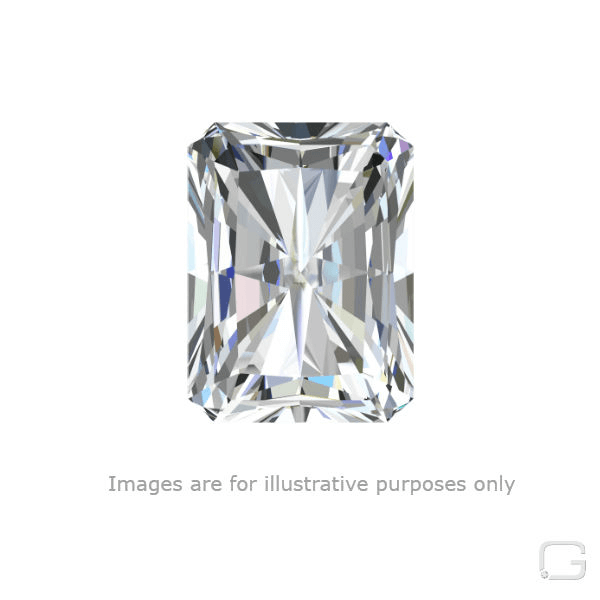 The diamond is graded J in colour, and has a clarity grade of VVS2. The diamond's GIA grading report number is 2266324930, which will detail further its specifications and measurements, and will also come with the purchase of the stone. AUD 6,095 Excl. Duties / Taxes. This Radiant diamond is 0.91 carat in weight, and comes with Very Good polish and Good symmetry, as verified from an independent gemological laboratory. The diamond is graded D in colour, and has a clarity grade of VVS2. The diamond's GIA grading report number is 13451799, which will detail further its specifications and measurements, and will also come with the purchase of the stone.